They did so under the pretext that the Prussians were “being cut off” during the run of the Grande Armée from Russia. The formally insignificant “Convention of Tauroggen” saw the neutralization of the largely capable Prussian corps on Prussian territory – subject to “incoming orders” from the Prussian King . Russian general Diebitsch had been authorized by Tsar Alexander. 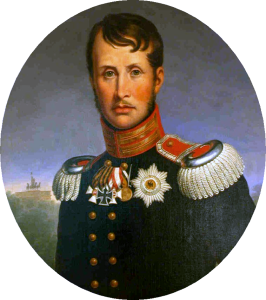 For Yorck there was no such authorization by the Prussian King Friedrich Wilhelm. From him it was only known in general terms that he wanted quit Napoleon and their frequently violated “alliance”. It was also known however that he wanted to wait for a decision from Austria. He knew little of the complete disintegration of the French army (yet). He sharply condemned the high-handedness of Yorck (initially) and ordered his arrest and court martial. “to await the bullet on the sand pile as calmly as on the battlefield on which I have become gray”. – in which he was right -, and called on his Senate to order 350,000 new recruits on the spot. “The act of General York prepared the shift of alliances: the East Prussian estates – supported by a broad patriotic movement – raised a popular army [title picture of this blog]. Thick volumes of donation files prove that the rural population has been grasped by a broad political emotion” . Simulaneously on 23 / 24 February 1813 the Russian-Prussian alliance of Kalisch was signed. On 17 March 17 1813, for the very first time in history the Prussian King issued the “Appeal to My People” directy to the Prussians, to justify his policies. The “Iron Cross” decoration was designed by Schinkel and for the first time a military award was created for all ranks. The successful war of liberation against France, which was joined by Austria and Sweden in addition to Russia, led to 100 years of peace in Europe. Napoleon’s war of aggression of 1806 led to the severe defeat of the Prussian army at Jena and Auerstedt. In the “Peace of Tilsit” of 1807 Prussia lost half of its territory and had to provide significant “contributions” . The plundering of the country by the French and the endless prolongation of the occupation after the peace agreement led to an atmosphere filled with hatred against the occupiers. The peace which tore half of my subjects from me, did not give us his blessings; it tore us deeper wounds than even the war. The essence of the country was drained, the main strongholds remain occupied by the enemy, agriculture was paralyzed, as were the crafts of our cities. Freedom of trade was inhibited, thus blocking the sources of acquisition and prosperity. The country became prey to poverty. By the strictest fulfillment of obligations I hoped to gain relief for my people and finally convince the French Emperor, that it is to his advantage to grant Prussia independence. But my purest intentions were thwarted by arrogance and disloyalty, and only too clearly we saw that the emperor’s contracts even more than his wars were destined to destroy us. Finally on 24 February 1812 Prussia was forced to take part as an “ally” in Napoleon’s coming war against Russia. Prussia had to provide a contingent of troops for the Grande Armée and through its territory wallowed plundering columns of Napoleon’s multiethnic army. Yorck embodies the independent-minded officer who takes serious personal risks in order to act for the whole. He succeeded with cool determination to correct the diplomatic errors of Prussia, Russia and Austria from the previous decade using a favorable moment. Against Napoleon’s imperialism, the former “Eastern Powers” of Prussia, Russia and Austria had no common political and diplomatic concept. Prussia was in isolation due to its neutrality. 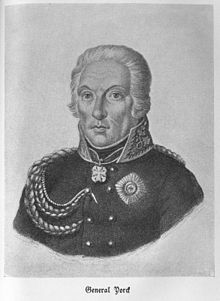 In 1805 Friedrich Wilhelm after long hesitation concluded an alliance with Russia, but was afraid to intervene in the war of Austria and Russia against France. In 1807 Russia dropped Prussia which was compelled to accept the draconian peace of Tilsit. In 1809 Frederick William resisted his reformers and the romantic poet Heinrich von Kleist who wanted to join the new campaign of Austrian Emperor Francis I against Napoleon. This despite the major defeat that the Austrians had wraught on Napoleon at the Battle of Aspern and despite the uprisings in Tirol, in the Kingdom of Westphalia, and in Prussia. In return, Austria refused an alliance with Prussia at the end of 1811 in order to prevent Napoleon’s Russian campaign. Prior to that Czar Alexander had unsuccessfully proposed Warsaw, Austria and Prussia a preventive war against Napoleon in February 1811 – which only accelerated Napoleon’s war preparations. In the end the uncoordinated diplomatic games were won by the party whose enemy could be tempted to invade Russia. The preservation of peace against an aggressive imperialistic power requires a unified political and diplomatic concept. This concept remains to be delivered by Russia, Germany and France as of 2015. The Anglo-Saxon oligarchy and its German fifth column have unexpectedly suffered a severe defeat in 2014 in the wake of their Russian containment (s. here and hier/here). They have launched a diversionary attack against the rebellious German people in 2015 (s. hier/here and hier/here). The Anglo-Saxon oligarchy does not consider their German vassals as reliable any more. Refer to Wikipedia for reign of King Friedrich Wilhelm III. (1797-1840) (German).